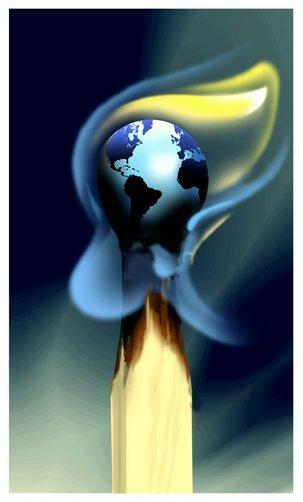 Are humans lighting the match to global warming, or is this argument a smokescreen concealing the truth? There is no question that human beings should respect the planet Earth. But we should also respect the truth. The following five reasons convince me that humans do NOT cause most of modern-day global warming. The popular belief that a scientific consensus exists on the causal connection between carbon dioxide (CO2) and global warming is incorrect. The claim of consensus is a distortion of the actual state of knowledge in this area—it oversimplifies complexities in analyzing the data that lend themselves to different interpretations. Do these elite organizations include all scientists working in the area of global climate change? No. There are many other people working in climate science or related fields who do NOT endorse the so called “consensus view”. (See, for example, list of scientists opposing the consensus view on global warming at http://en.wikipedia.org/wiki/List_of_scientists_opposing_the_mainstream_scientific_assessment_of_global_warming). Even the elite endorsers of human-caused warming admit difficulty in attributing global warming to human activities. The public demand for simple answers, however, forces public policy statements issued by these scientists into the realm of gospel truth. Proponents of human-caused warming argue that uncertainty here represents acceptable uncertainty accompanying all scientific research. This argument, however, seems inaccurate, since the firm causal link between CO2 and temperature rise remains non-existent (Richard Lindzen, Don’t Believe the Hype, http://www.opinionjournal.com/extra/?id=110008597). Red Flag – What’s Wrong With This Picture? There is reason to suspect that something besides science has compromised integrity in the area of global warming research. The biggest red flag for me comes by way of Richard Lindzen – Sloan Professor of Atmospheric Science at MIT and member of the National Academy of Sciences. Lindzen suggests openly that widespread agreement on human-caused global warming is a result of a bandwagon mentality or a search for notoriety and money. 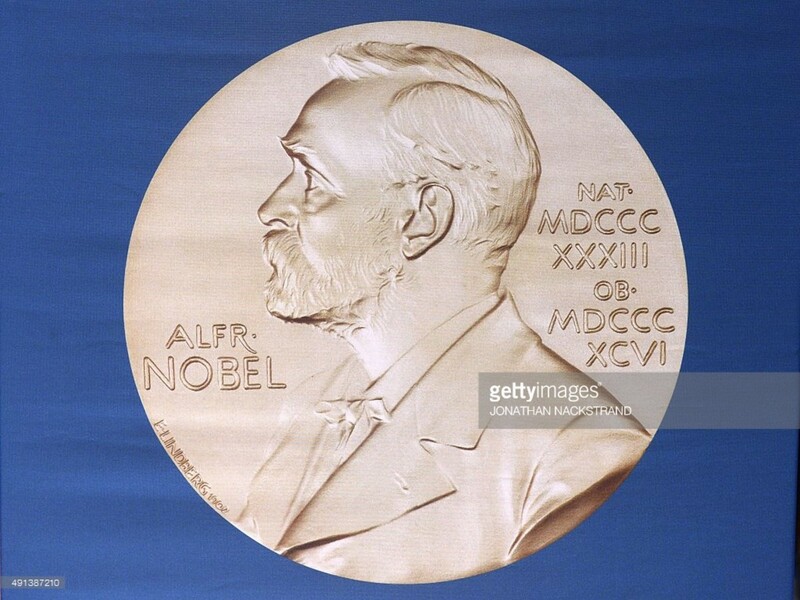 He further charges that the National Academy of Sciences and other professional organizations have been corrupted by environmental activists who influence the public statements these organizations make (Greg Craven, 2009, What’s The Worse That Could Happen, New York, Penguin Group, p 137-138). 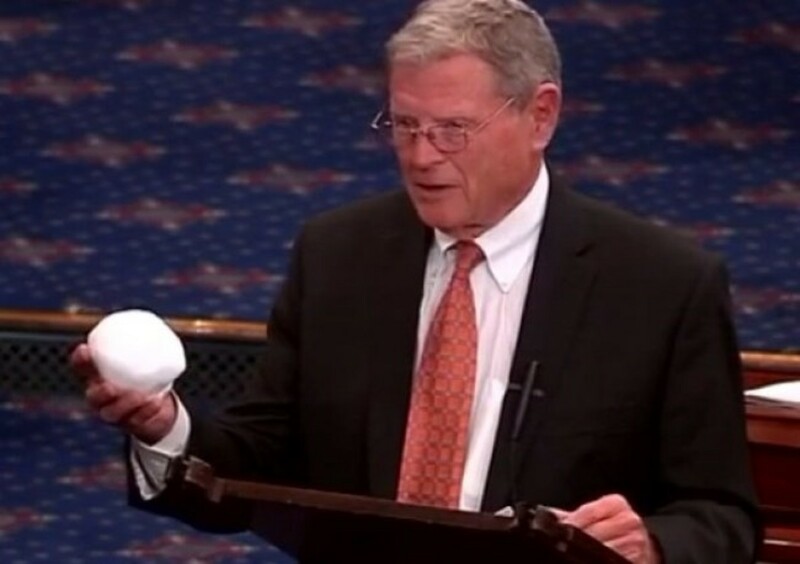 He is a credentialed, accomplished climate scientist at an elite technical institute (MIT). He is (was?) a member of the National Academy of Sciences (one of the organizations he charged with being infiltrated by misled activists). He risks open attack by a formidable group of peers. Why would such a person—accomplished in the specific scientific field under question, and highly placed at an academic institution known for its excellence—level these charges, unless they were true? Environmental lawyers or climate lawyers might try to discredit Lindzen because none of his accusations appears in peer-reviewed journal articles. And how could they, when these journals are controlled by editors who favor the very organizations Lindzen accuses? When a credentialed, respected scientist in the specified field comes forth in the only forum available to him for relaying such information, then I have to allow a grain of truth in his claims. In support of Lindzen’s opposing view on the popular consensus claim, a survey by Klaus-Martin Shulte (of Kings College Hospital) found that only 7% (seven per cent) of all the papers on climate change published between 2004 and February 2007 explicitly endorsed the position that CO2 from human activities is causing catastrophic global warming (David Bellamy, Today’s Forecast: Yet Another Blast of Hot Air, http://www.timesonline.co.uk/tol/comment/columnists/guest_contributors/article2709551.ece). “First, there is no such consensus: An increasing number of climate scientists are raising serious questions about the political rush to judgment on this issue. For example, the widely touted “consensus” of 2,500 scientists on the United Nations Intergovernmental Panel on Climate Change (IPCC) is an illusion: Most of the panelists have no scientific qualifications, and many of the others object to some part of the IPCC’s report. The Associated Press reported recently that only 52 climate scientists contributed to the report’s “Summary for Policymakers.” Likewise, only about a dozen members of the governing board voted on the “consensus statement” on climate change by the American Meteorological Society (AMS). Rank and file AMS scientists never had a say, which is why so many of them are now openly rebelling. Estimates of skepticism within the AMS regarding man-made global warming are well over 50 percent.” (Fred Singer, Global Warming: Man-Made or Natural, http://www.buckeyeinstitute.org/docs/globalwarming.pdf). Champions of human-caused global warming, then, have redefined “consensus” to mean “those people who agree”. This is not what “consensus” means. “Consensus” means MOST of the people involved—in this case, most of the people involved with climate science—clearly not the case. Many people DO agree, but a number of other people do NOT. Consequently, the word, “consensus”, suffers widespread misuse. A proven causal link does NOT exist between human CO2 emissions and recent global temperature rise. Believers of human-caused global warming insist that Earth’s CO2 (carbon dioxide) has increased abnormally during the latter half of the twentieth century and that the source of abnormal CO2 increase has been the burning of fossil fuels. How do we measure this? To determine an increase in CO2, we must establish a baseline from which to begin measuring. In 1940, G. S. Callendar determined this baseline as 292 ppmv (parts per million by volume). To see how he arrived at 292, look at the picture below, where average values of atmospheric CO2 are plotted for the years, 1800 through 1955. In 1940, G. S. Callendar selected a trend in his CO2 data set that other people found too random to use at all. The circled points are the only data Callendar used from this whole data set. Even though the values ranged randomly between about 250 to 550 ppmv, Callendar selected his data carefully to present the appearance of a steadily rising trend—from 292 ppmv between years 1866-1900 to 325 ppmv in the year 1956. Callendar rejected a large chunk of the data whose values were 10% more than what he called a “general average”, which he neither defined nor stated outright. What all this boils down to is that the WRONG (or impossible to determine) baseline has been used as a historical reference for modern atmospheric CO2 measurements. Consequently, Callendar’s error or bias has been a basis for accumulating other errors and biases in modern-day climate models. The early work of Callendar illustrates just one of the problems with CO2 data. For a complete technical description of other CO2 data problems (including ice core data), see my reference source—an article by a geochemist and geophysicist (Tom V. Segalstad, Carbon Cycle Modeling …, http://www.co2web.info/ESEF3VO2.pdf). See also another good source that elaborates Callendar’s bias and ties it into modern-day biases (Tim Ball, Time to Revisit Falsified Science of CO2, http://canadafreepress.com/index.php/article/18343). Perhaps the biggest bias is presuming that 600,000 years or so is the given interval during which we humans should judge CO2 fluctuations. We might do well to ask the question, Does nature have a preferred level of CO2 ?—and a preferred time span over which its CO2 varies by an “acceptable” amount? Furthermore, are we humans big enough to have any real effect with our CO2 emissions? Given that CO2 is a relatively minute proportion of Earth’s greenhouse gases, and given that all of Earth’s greenhouse gases together are a relatively minuscule proportion of Earth’s total atmosphere, we might question whether such a tiny gaseous fragment can actually drive everything else. 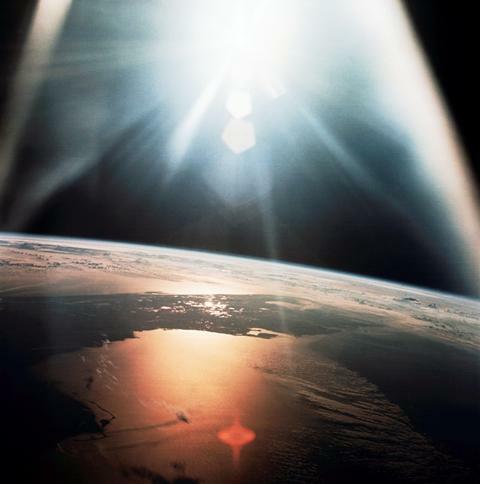 Is Earth really so fragile that a few hundredths of a percent of its atmosphere can doom any one era of its life forms? Arguments that say “no” seem to be mounting. 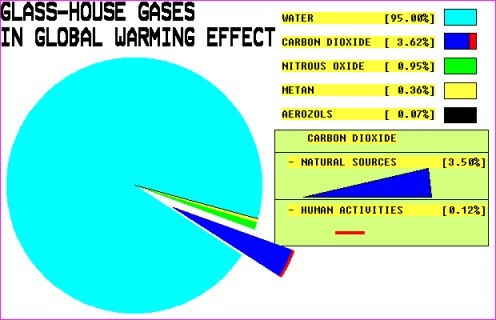 Claiming that CO2 causes global warming means that 0.037% of Earth’s atmosphere controls the other 99.963%. This 0.037% of Earth’s atmosphere includes both NATURAL and HUMAN-MADE C02 sources together. If we look only at the human-made contribution to Earth’s 0.037% CO2, then the amount of CO2 causing global warming is 0.00177% of Earth’s whole atmosphere. The specific claim that HUMAN-MADE CO2 causes global warming, then, means that 0.0017% of Earth’s atmosphere controls the other 99.9983% of Earth’s atmosphere. This would make CO2 an incredibly powerful gas and something we should fear, indeed. To better understand the human-caused CO2 claim, look at the two pie charts below, which illustrate, first, Earth’s entire atmospheric composition and, second, Earth’s greenhouse gas composition respectively. Earth's WHOLE atmosphere is mostly nitrogen and oxygen. Think of the second chart as a blow up of the tiny 1% slice of the first chart. Many scientists who deal with mathematically advanced climate models might laugh at such a basic analysis. A website by Monte Heib, for example, has frequently been a target of such laughter (see his website at http://www.geocraft.com/WVFossils/greenhouse_data.html). A sober response to this laughter consists of two words: “first principles” or maybe better, “common sense”. Refer to the second pie chart above—notice that the tiny 1% of Earth’s atmosphere composed of greenhouse gases consists mostly of water vapor. 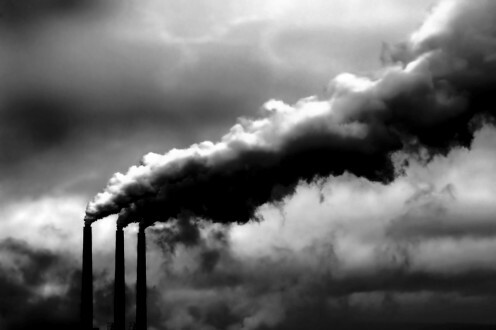 Water vapor is the primary greenhouse gas that dominates all atmospheric CO2 by a factor of 26 to 1. In other words, there is twenty-six times more water vapor in Earth’s atmosphere than CO2. Remember, water vapor is the primary greenhouse gas. Claiming that human CO2 causes global warming now means that only 0.117% of Earth’s greenhouse gases drive the other 99.883% of Earth’s greenhouse gases, which drive the other 99% of Earth’s entire atmosphere. This is how the climate models seem to represent it—they multiply the effect of CO2, and they do this with a degree of certainty regarding CO2 NOT matched by a similar degree of certainty regarding water vapor (the most abundant greenhouse gas of all). This simply strikes a dissonant chord in any intelligent person. John Coleman explores this dissonance in detail (John Coleman, The Man-Made Global Warming Crisis Cancelled, (http://ftpcontent.worldnow.com/kusi/Comments+on+Global+Warming02.pdf). Coleman acknowledges that current climate models are impressive and complex, but he points out disparities between model predictions and real-world observations. Following his lead and the leads of others, I ask whether these climate models are complex enough to represent reality in detail. There appears to be an alternate “consensus” that answers, “No” (see NIPPCC—Nongovernmental International Panel on Climate Change, http://www.nipccreport.org/, and see Global Warming Petition Project – 31,000 Scientists, http://www.petitionproject.org/index.php). Believers in human-caused global warming claim that the sun has shown no significant increases or decreases in power output during the past hundred or so years—they are mistaken. True, the sun’s power output ALONE has not increased significantly to account for the observed global warming over the years 1900 to the present. What many people fail to understand, however, is that the sun exerts an additional effect on incoming galactic cosmic rays—very energetic particles constantly streaming towards earth from deep space, determining overall cloud formation. Many believers in human-caused global warming also do not know about questionable statistical procedures that the IPCC (International Panel on Climate Change) used to assess solar effects in relation to temperatures. According to Christopher Monckton (Climate Chaos? Don’t Believe It, Telegraph.co.uk, May 11, 2006) – the IPCC used the year 1750 as its starting point for measuring solar effects, but used the year 1900 as its starting point for measuring recent global warming. Why did 150 years separate IPCC’s two starting points? The sun’s activity was at a high in the year 1750 and at a low in the year 1900, which made the average sun activity starting in year 1900 seem less significant. In other words, the IPCC averaged sun activity over a period 150 years longer than it averaged temperatures. This made the sun appear to be less influential (by more than double). Since climate models did not treat either CO2 or solar effects in a simple linear way, the models underestimated the total solar effects by a factor of six (using a climate forcing multiplier). The IPCC’s solar calculation, then, was six times too low. Next, Monckton claims, the IPCC reduced the natural greenhouse effect by 40% from what climate-physics textbooks say it should be (from 33 C to 20 C), causing human-made CO2 contributions to appear larger. Finally, Monckton claims, the IPCC selected the biggest 20th century temperature fluctuation (remember, ignoring the relationship between sun and temperature for a 150-year span from year 1750 to year 1900). Not only has the IPCC concealed the sun’s real power fluctuations over the selected temperature range, it also has dismissed a strong correlation between sun fluctuations and temperatures over hundreds of years. 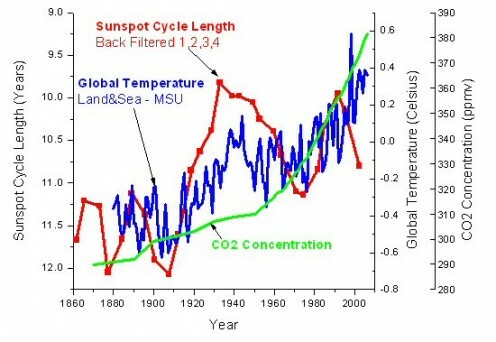 Even during the years 1900 to present, the sun’s activity correlates with temperatures better than CO2 correlates with temperatures (see chart below). Sun activity tracks global temperature BETTER than CO2 tracks global temperature. Again, this dismissal of the sun’s influence occurred either because people misunderstood or intentionally misrepresented the sun’s interaction with galactic cosmic rays. In brief, a hotter sun spews out a stronger solar wind, which deflects more cosmic rays, which causes fewer clouds to form, which allows the hotter sun to shine on an earth with less cloud cover. Actual data shows a strong correlation between solar activity, temperature and cloudiness. This correlation, according to Ian Clark, is “the most direct and telling line of evidence for a heliocentric [sun-determined] climate.” Clark is professor of hydrogeology and paleoclimatology at the University of Ottawa (see Ian Clark, Solar Activity Causes Global Warming, in the book, Global Warming Opposing Viewpoints, ed. by Cynthia A. Bily, 2006, p. 76-82). According to Nir J. Shaviv, an astrophysicist at the Racah Institute of Physics, fewer cloud condensation nuclei causes clouds of lower altitude with larger water drops and shorter lifetimes, which also warms the Earth (read his analysis, Nir J. Shaviv, Carbon Dioxide or Solar Forcing?, scroll down his page to the section titled An Alternative Explanation … , http://www.sciencebits.com/CO2orSolar). For an even more detailed understanding of solar activity and Earth’s climate, read a paper from the Danish Meteorological Institute, in Copenhagen (K. Lassen, Long-term Variations in Solar Activity … , http://www.tmgnow.com/repository/solar/lassen1.html). 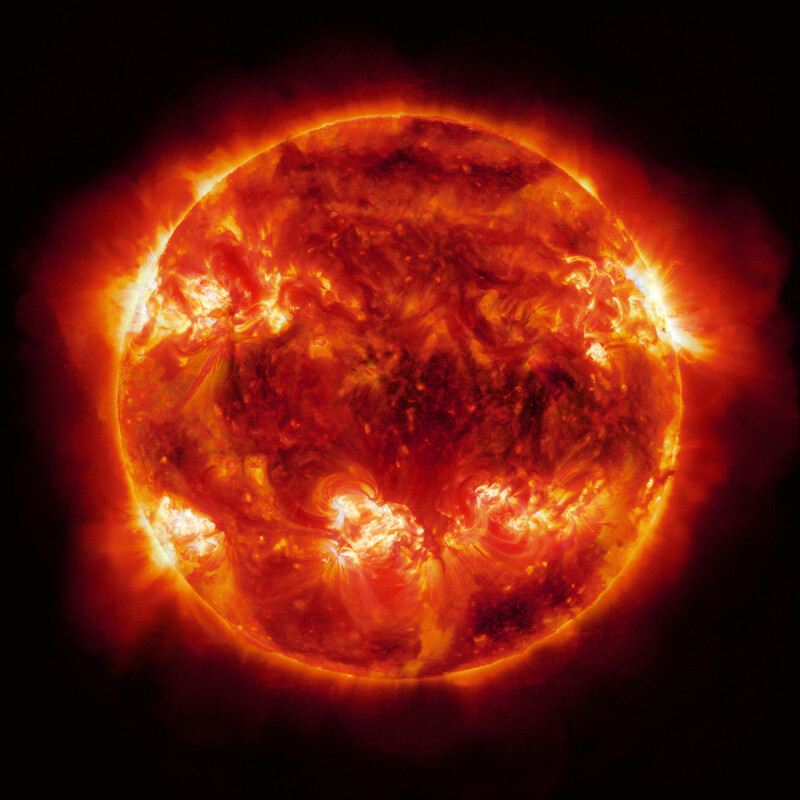 The sun has been more active in recent decades than in the past few centuries. Variations in solar activity fit with patterns of warming in the first half of the 20th Century . Variations in solar activity also trace the cooling trend of the 1960’s and 1970’s and the warming trend of the past decades (which CO2 does NOT). Whenever you look at graphs that plot CO2 against temperatures, notice erratic leaps in temperature compared to steady rises in CO2. Whenever you look at graphs that plot sun activity against temperatures, notice a better correspondence—the cosmic ray explanation seems to explain why. Current research, thus, indicates that the sun’s TOTAL effect on climate appears to be more significant than previously thought, and that human CO2 effects are not detectable. Both ground and satellite measurements indicate a recent downward trend in global temperature. Global mean surface temperatures have shown a downward trend for eight straight years, defying all the climate models that the IPCC (International Panel on Climate Change) has relied upon. Earth’s oceans have shown a cooling trend. The fastest portion of Earth’s recent warming occurred between 1910 and 1930, BEFORE widespread industrialization at modern levels. Between the years 1940 to 1975 and again between the years 2001 and the present, global temperatures have shown a downward trend. There has been no trend in global sea-ice throughout the 30-year satellite record. For eleven years, from 1993 to 2003, the Greenland ice sheet grew two inches per year, growing almost two feet in thickness. Its ice loss in 2003 was only 0.03% of its total mass—well within long-term variability throughout its history. The end of the present decade (2000 – 2010) will be cooler than the beginning, even as CO2 concentration continues to increase steadily. These five flaws render the human-caused global warming claim unbelievable to me. Quite contrary to scientific reasoning, the biggest reason I see for advancing beyond fossil fuels is aesthetic. A cleaner, more efficient, independent civilization of energy users is simply more elegant. Life could be prettier, healthier, and more harmonious because of an improved energy infrastructure, but this infrastructure needs to evolve via inspiration, NOT fear. Inspiration, in fact, is the real root of human beings’ success on this planet. Our success depends just as much on what we do not subtract from Earth as what we add to it. I frequently see the words, “deforestation” and “land use patterns” side-by-side the words, “emissions” and “carbon dioxide”. These word associations help confirm my belief that humans are forgetting their most powerful CO2 mitigator of all—plant life, trees, forests, sea plankton and the whole web of natural growth that includes us and asks us to work with it for the good of everything. That 10 minute video explains it. Want to worry about a man made catastrophe that is going to lead to our demise? Studies contained within its own set of parameters is hardly proof of anything. Other than it exist's and functions in a controlled manner within its own experiment. (Set up by computer models). The writers investigated the effect of CO2 emission on the temperature of atmosphere. Computations based on the adiabatic theory of greenhouse effect show that increasing CO2 concentration in the atmosphere results in cooling rather than warming of the Earth's atmosphere. "The fact no one agree hardly proves a lot." "Does the data prove that the Earth is warming." "If you burn 40 percent of the Worlds Carbon, it has to have some kind of effect." "If our supply of carbon is limited when do you plan on finding alternative fuel sources?" "If oil is a major ingredient to so many materials it would make sense to find a sustainable way to keep what we have for continuous use." "What are we defending by denying all these problems in simply burning it now." "We stay the course until no one can afford it. We then need it for so many other things then to burn it. If global warming is true and its due to carbon then we face a huge problem." "I am sure all things are a factor but alternative energy is advancement. Conquering it might even get us off this planet." The fact no one agree hardly proves a lot. Does the data prove that the Earth is warming. If you burn 40 percent of the Worlds Carbon, it has to have some kind of effect. 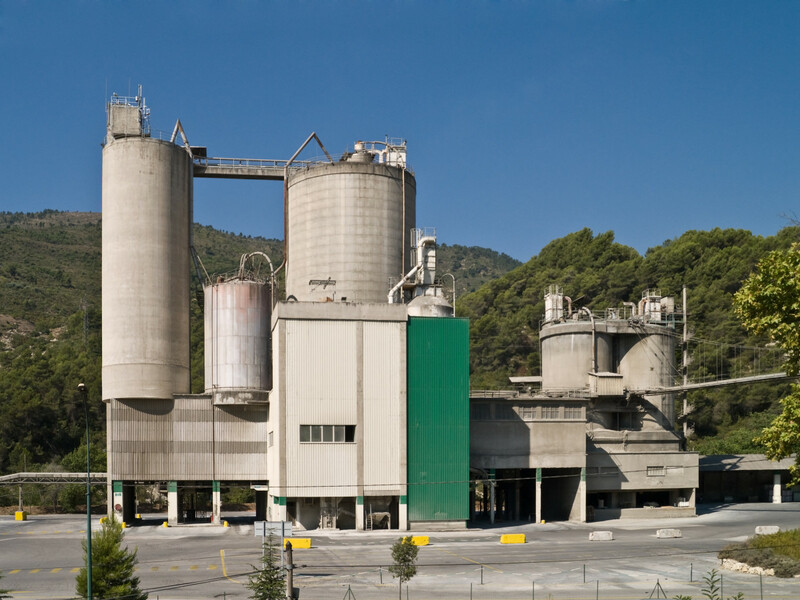 If our supply of carbon is limited when do you plan on finding alternative fuel sources? If oil is a major ingrediant to so many matierials it would make sense to find a sustainable way to keep what we have for continous use. What are we defending by denying all these problems in simply burning it now. We stay the course until no one can afford it. We then need it for so many other things then to burn it. If global warming is true and its due to carbon then we face a huge problem. I am sure all things are a factor but alternative energy is advancement. Conquering it might even get us off this planet. Your willingness to keep an open mind and study the argument to its fullest as it grows is very insightful and has the quality of learning more of the subject (while teaching me). I have no interest to delve that deep into the argument but I to recognized the quick bandwagon jumping as the press, politicians, and their minions of political power drive headlong. The problem I had was not wanting to go over the cliff if that is where the bandwagon is heading. I listened to Dr. Tony Rizzo ( a world renowned physicist) talk about his book "Science Before Science". and one of his points made loud and clear is not to conclude before it is the time to conclude. So, continue to grow the message towards the facts dictated by science about the atmosphere! I wish William would have continued, he was passionate without too much arrogance. Please indulge me if you will. Isn't CO2 what plants thrive on? Meaning -More vegetation more to eat. Isn't it better to be warmer than cooler? If ice is in a glass and you fill it to the top doesn't the volume of water stay the same as the ice melts? Meaning, ice melting, increasing the volume of the Earth's water theory, maybe needs rethinking. I'm just a simple man, but, Just asking. I'm thinking to myself:" C'mon Global Warming!" I live in Wisconsin and could use some more heat. "...it is completely accepted in the literature that water vapor is the most important greenhouse gas. The way you write it, one gets the impression this fact is not considered." The majority of articles and graphs for public consumption completely ignore and omit any reference to water vapor and its relationship to trapping heat. Very well covered article. I agree that the science is not supported for global warming. Also, temperatures fluctuations tend to correspond more to volcanic activity than human activity. Sun spots are also suggested by some climatologists to affect Earth temperatures. We need to keep following the money. I personally believe that carbon is playing a part in global warming and regardless of good scientific data, common sense would say it is. Still I think its only a covert story for something far worst. Try some research on a Polar shift and the current magnetic field and you might be going not good. The Magnetic fields would decline at the poles first allowing them to warm up. Then magnetic fields in the mantel would then begin drifting causing anyone's guess. Look up South Pacific anomaly. Earth quakes, weird weather and honestly we are pretty clueless as to how strange this event could be. Imagine eight sets of Northern lights because of eight separate magnetic fields on Earth. If things get bad then warming up Earth with Carbon might be a big concern. Its just something to ponder because regardless of belief the data of the planet warming up is not a myth, maybe what is causing it is debatable. Reducing carbon sounds easier then a 2,000 year polar shift that is 30, 000 years over due. I am amazed by the persistence of the false claim that I misunderstand the basics. Again, perhaps it is YOU who misunderstand the basics, to the point of ignoring my presentation of them in an alternative light that goes against the popular view that humans are the main cause of global warming, which is ridiculous. There is so much wrong with YOUR condemnation of my article. You merely make a blanket statement of fault, hoping that other readers will be swayed by your fearful unwillingness to consider the possibility that the popular conception about global warming is wrong. "Professional help"? Please, save your weak attempts to discredit for someone less intelligent. Perhaps it is YOU who do not grasp some very basic concepts, such as how orthodox climate models fail to treat water vapor adequately, because there are key questions about its effects that still remain unanswered. Your polite suggestion about my ingnorance, thus, smacks of smug arrogance. You seem to misunderstand some basic concepts. Nobody doubts the important influence of the sun on climate nor is there any question about the fact that the natural variations between glacials and interglacials are real (see Milankowich theory). It is even accepted that previous interglacials (the warm periods similar to the Holocene, the period we are currently living in) were warmer than what we experience today. However, the fact that these things exist is not in conflict with the fact of the human influence on climate which is generally referred to as human caused global warming. Robert, there is so much wrong in what you write, it is unbelievable. It is complete nonsense and has no scientific background whatsoever. I won´t even bother to go into details here. Others tried before me (see above) but much much more could be added to show how badly founded your theories and claims are, what cheap tricks you use (e.g. presentation of out of context and incompletely cited literature or manipulated datasets and graphs). You present studies in a way that their authors would wonder if you are even able to read let alone being able to understand the most basic principles of physics. Anyhow, the one thing I wonder is why guys like you are trying so hard to spread wrong facts. What´s your motivation behind it? It must be vanity and the aim to finally get at least a little attention and recognition in our big world. Please seek some professional help instead, no need to do any harm. Yes,.. weemingly money and control through fear and lack of inertia to budge from favored points of view that keep lots of people employed and receiving grant funding. It's about Money and Control. Follow your own advice, and you will debunk your own arguments. Yes, let's look at the time scale, and when we do expand our view like this, we will see much of the name calling (i.e., "disbelievers") as shortsighted. There are many many more credible counterarguments to anthropogenic global warming than I present. Truly open minds will consider all these. Read my other hubs on the topic too. Lord C. Monkton is not credible. There are too many reasons for me to go into, but I encourage you to do your own research into this guy’s background. You might find a video called “Debunking Lord Monkton” provides good starting points for further investigation (http://www.youtube.com/watch?v=JfA1LpiYk2o). It could even be amusing if it weren’t for so many people willing to adopt this guy’s points as their own and make him a champion of the point of view they’ve committed themselves to. I also wonder about Richard Lindzen, who has made one suspicious argument in particular that lacks credibility to me (given his apparent scientific pedigree), in that he picked a short, statistically insignificant time period (1995 to 2007) to assess both climate change (which is a long-term event) and concordance amongst the scientific community over climate change during that period,. You can argue anything you want if you cherry pick a short time period of your choice because of course there cannot be a 95% certainty level about statistical significance over such a short time period. This is not an error that a top notch scientist would make, so therefore I have to wonder what is his motivation is in doing this? Why knowingly present misleading information? I know the vast majority of people will be ignorant to this ploy and conclude that climate change must not be real if this guy is saying so. This is very puzzling to me and calls his credibility into question. In any case, as much as I would like anthropogenic climate change / global warming / climate destabilization (or however you want to brand it) to be the grand conspiracy that deniers like to suggest it is, I have yet to read any credible, compelling evidence that stands up to a little investigation, including this blog post. I'll check out your hub now. With my outlook, I WILL be one of those people who get the facts straight. The evidence for the dangers of smoking cigarettes is FAR, FAR, FAR more powerful than the evidence for human beings causing dangers to the planet via fossil fuel burning. We are not talking about a whimper of disagreement here on this issue. We are talking about MAJOR discrepencies in both the facts and in the communication of the facts. What if YOU are wrong, and all the money spent on uselessly trying to reduce CO2 emissions robs future disaster victims of aid?, ... robs countless dollars from the creative development of alternative technologis driven by inspiration instead of fear?, ... robs society of the basic standard of proof that keeps science honorable? Are you still NOT reading anything that I have written? With your outlook, you would have been one of those people still smoking cigarettes in the fifties. There is rarely totally agreement on any subject, especially in the field of science. A rational person considers the risk of being wrong, weighs up the odds and then avoids the riskier outcomes. What if you are wrong and all the scientists who spent their life working on climate change are right? The key word in my title, “Five Glaring Reasons To Disbelieve Human-Caused Global Warming”, is GLARING, … as in “obvious”, “primary”, “main”, “fundamental”, “basic”. Within my five GLARING reasons, you will find data that CHALLENGE your, “hundreds of thousands of reasons, data, correlations, scientific fact, to support man-made global warming”. I am looking out my window now, and I see hundreds of ugly cars clogging streets, fouling my air, and obstructing my view of trees, grass and plants. I see crowding, congestion, bad, cheap-designed buildings, and too many people living too unhealthy lifestyles. But what I do NOT see is the reality of CO2 causing run-away heating of our planet, poisoning of our biosphere, and incriminating human technology that has allowed a standard of living unprecedented in the history of our species. This simply has NOT been proven by any previous standard of scientific testing and rejecting of hypotheses. What has been proven is the human capacity to allow simple-minded passion to politicize power structures into misleading masses of people towards political agendas supported and well hidden by sloppy science. And, NO, I do NOT work for an oil company. Look outside your normal biases for the truth. I did – I used to believe in what you believe in, until I opened my eyes a little wider to the greater complexity of this issue. You managed to find a whole 5 reasons good job man!! There are thousands if not hundreds of thousands of reasons, data, correlations, scientific fact, to support man-made global warming.. Just look outside your window dude... do you work for an oil company? Odd. Wilson constantly uses the "CO2 is a greenhouse gas that man is making and changing the climate" argument. That's about all these AGW religious fanatics have, it seems. Clearly the Medieval Warming Period wasn't caused by human activity, clearly the melting of the last 5 ice ages wasn't caused by humans... Clearly CO2 has TRAILED temperature increases each of these times (not lead it)... But still, they whine on and on that it's MANS CO2 that is causing today's (natural) cycle of climate change. Arrogance - a form of Pride. And not far from another word. Ignorance. I saved a copy of the article. I skimmed it very quickly. The writer seems to take a conservative tone in addressing the "consensus" view, while using charged language ("denialists") to address those who are rightfully skeptical. This makes me even more skeptical (^__^). I've read some of the email comments from the "Climategate" email hack, and I cannot fathom in what context some of those comments could be construed any other way than as they appear. This makes me wonder who the real "denialists" are. I am guessing that the prestigious NATURE magazine has a huge obligation to the mainstream scientists, whose papers it has supported. Lots of jobs, research funding, policies, and chosen courses of action have been solidified based on the mainstream view. I understand that it is tough to question this, let alone try to start undoing all that. This is how civilization works. People NEED to make decisions, and they need decisions to build infrastructures and policies. These things then lock in reflexive behaviors that we no longer need to think about in order to carry out the daily performance of our lives. Decisions literally get imbedded in our bones BEYOND the original logic that helped imbed them. This is why change happens slow. There's no other way. Humans need time to reassess, retrain minds and bodies, and ingrain new instinctive behaviors. But that's a whole 'nother hubpage, isn't it? Thanks again for your critique, challenges, and sharing of resources. Agreed, CO2 is a greenhouse gas. Agreed, CO2 has increased in recent years. NOT agreed, Earth’s temperature has increased – yes, there have been periods of increase, but these have always modulated with periods of decrease. For the PAST EIGHT years, Earth’s temperature has DECREASED, while CO2 levels have steadily increased, defying every climate model the IPCC relies upon. If the hypothesis is that CO2 does not cause global warming, then this past eight-year trend DOES support this hypothesis. Can I prove that the amount of CO2 increase we have seen will not cause global warming? Well, the above apparent fact seems to be a strong piece of evidence in the direction of answering, “YES”. How do you explain an eight year global mean temperature decline in the face of an increasing human CO2 increase? Yes, others besides Collander have measured CO2. Your link to CO2 history starts with Keeling, who was a number of years AFTER Collander. Collander ignored CO2 measures that were quite a bit higher than his chosen sample. Why did he ignore those higher numbers? Keeling seems to have come into play later, following Collanders suit. What happened that caused such a discrepancy in those early years? Why did measures of CO2 under 300ppm seem to become the Holy Grail from which we measure an increase. Something seems fishy. Now getting to ice-core proxy data, .. did you realize that early measures of ice core CO2 samples also were quite a bit higher than they were later measured to be? Funny, how both Collander’s and early ice-core measures of CO2 eventually ignored the higher values. Why? Also, ice masses occur over cold regions—are ice cores true measures of global or regional climate-shift dynamics? These are questions I have to approach, as I continue to study things. As I continue, I will also get pristine in choosing my sources of information. If the consensus argument is a straw man, then lots of people love their straw in making the case for anthro-global warming. That’s why I have to deal with the straw (so to speak), because a lot of other people seem to take it pretty seriously. "Recent indirect data and direct measurements from ice cores point towards a lsquopre-industrialrsquo CO2 level of around 260–270 ppmv, considerably below the commonly assumed value of 290 ppmv. Early measurements from the southern hemisphere tend to favour the lower value." 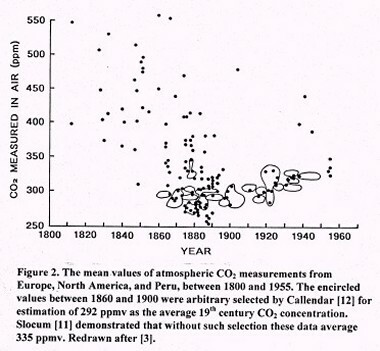 Regarding the baseline level of CO2: Callendar was not the only person who measured CO2 in the atmosphere. CO2 levels have been measured in a variety of ways by many different scientists. Robert - I'd been thinking that the whole "consensus" thing was kind of a strawman anyway. It is important to know your sources, and for laymen we have to make decisions about who to trust. This is why consensus is important. But if you want to debunk AGW as a theory, consensus or the lack thereof is not the best battleground. That's what climategate is about - an attempt to discredit some of the most prominent climatologists. The real work of debunking the theory should come from observations, predictions, and data. CO2 is a greenhouse gas - can you disprove this? CO2 has increased - can you disprove this? The earths temperature is increasing - can you disprove this? Can you prove that the amount of CO2 increase we have seen will -not- cause global warming? Good observations. Now we get into the battle of crediting and discrediting our sources. I really don't want to go that route. Suffice to say at this point: the fact that there is a healthy number of skeptics trying to be heard indicates to me that something is worth listening to on their sides. Alas, sometimes this means being published in the so called "lesser credible journals", since the so called "more credible journals" are controlled by editors or editorial boards favoring the mainstream view. Regarding your reference to greefrye.wordpress.com, there is a defined confrontational posture there that in itself makes me suspect of the contributor's underlying fear of having his castle of belief toppled. He blatantly condemns the Medieval Warm Period, which is not entirely out of the picture. Those who cry "regional trend" ought to remember that the Arctic and Antarctic are also REGIONS (polar regions) which are used as global indicators by the anthropocentric warming enthusiasts. Six thousand boar holes from around the globe still support the Medieval Warm Period as a global trend. About Peiser -- yeah, I later discovered that he somewhat recanted his study. Desperation makes us sloppy sometimes. I still believe that there is ample meat in my study so far to keep me in the sceptic's camp. I'm not done by any means. I plan to take on a few of those folks at places like greenfrye.wordpress.com. Anybody with that defensive a posture and tendency towards name calling needs a little smack down action of MY variety, assuming I can become informed enough to give a good performance. Bottom line: I remain unmoved from my position based on even more evidence that I have not written into this hub. Hope I can find the time to continue it all. Working on more research now. Thanks for your litmus test. That doesn't mean that I am convinced (or that I am convinced of the "other side")... my position is that most of the public has no clue how to assess this debate, because most of us lack the technical background to do so. You could be fooling us.... or "they" could be fooling us --I am mystified as to how any member of the general public can claim to have arrived at a conclusion one way or another. Regarding Peiser and Oreskes: Peiser has said: "my critique of Oreskes' flawed study was later found to be partially flawed itself". OK Robert - I have limited time and there's a lot to cover, so I'll be looking at these things little by little. First - regarding the 500 papers. Hey Robert, finish your "smack down" here. Ha-ha! I understand your re-post dilemma, in which you don't want to re-type, as you say, in-the-moment replies...BUT, a little recapitulation never hurts. Hey, you're your own authenticity - regardless of repeats or re-do's due to techno glitches. Finish your comment, please. By the way, in your last comment, are you promoting Jerry Springer? Now, in that style of debate, that's some debatable market share, isn't it? I just wanted to point out that a fellow hubber, William R. Wilson, has a pretty cool (uh, I mean "hot") hub going on in the opposite vein of mine here. Check out the vertical bar on the right that lists similar hubs (HIS is on proving that warming IS happening). Looks like we're siding up for some really good point/counterpoint smack down here (^__^). I promise -- I'll keep it nice. NICE?! Now that doesn't get you market share anymore! "Jerrry! Jerrry! Jerrry!" CO2 poisoning? I can't help that CO2 is the by-product that was labeled by many as the cause of the "warming effect." Atmospheric water vapor definitely has a lot to do with it, with or without CO2 theories attached. We're heating up this joint, regardless of other possible stellar forces that might impact our relatively large atmosphere versus us tiny humans. Human beings are burning & polluting this little world up, on a daily basis. Yeah, it is a slow process, but unless we change, it is only going to get worse. It wouldn't be a measly contribution by us insignificant Homo sapiens - if we sent a couple nuclear missles off, now would it? It is better for "big oil" big-shots to deny Global Warming, as a debunk of old theories would be more sound for certain corporations and global affairs...hence more oil money to dispense amongst greasy palms. Retrospectively, before everything settled, this planet used to be a ferocious lava zone; why is it such a bad notion to believe that we can't eventually re-stir the pot by mining and re-burning on a regular basis - in one way or another? Wow, this is a lot to take in. I'm going to have to come back and check this out. I'm just starting to dig into Iain Murray's "The Really Inconvenient Truths" so I look forward to comparing notes. I'm not anti-green. I'm just anti hysteria and fear mongering. Thank you for doing so much work on this important issue. TO William: I used to believe humans were the culprit. Now I believe politics is the real culprit. TO SimeyC: As I see it, there is quite a bit of debate about exact scientific techniques that support either belief on this issue. Politics, of course, influences which side gets heard the loudest. TO Neil Sperling: I'm not sure about the tidal forces you mention, but I do know that there is additional speculation about a rotating hot spot at Earth's molten center, which might affect climate. TO Obscurely Diverse: Humans are responsible for dirty air, overcrowding, ugly landscapes, and a host of social ills that make us more miserable and desperate for sensationlized stimulation. Let's not confuse this with CO2 poisoning. As I pointed out, Earth's atmosphere is far bigger than our current, measly contribution of CO2, and our effect here is blown away by forces far bigger and far more powerful than us at the moment. Thanks for your impressions. TO ALL: Thanks for input and viewpoints. Keep 'em coming. I still have to think humans are mostly responsible, due to our industrial & population boom over the last few decades. I mean, how can such a huge change by Earth's inhabitants not effect the planet? I think more studies need to be done on the 'increase in Atmospheric moisture' and/or water vapor. Hmm, maybe that's why most of the creeks around here has dried up. No matter who is right or wrong...I couldn't help but think, after viewing your image of the 3 polluting smokestacks, "regardless of Global Warming conflicts, that can't be good for the long term." That was a good contrast and a very detailed hub that will surely get some people thinking. I've been a disbeliever of global warming for a long LONG time. Another factor not considered in your argument is the correlation to Mars. Just a few summers back (2 if my memory is correct) Mars was closer to earth than it had been in over 4000 years. If the moon can influence tides - doesn't it stand to reason Mars influences us somehow too. I've never came across a study of this but there is no doubt that other planets effect earth same as does the moon, but a 4000 year cycle is harder to study than the moons 28 day cycle LOL. The toe bone is connected to the foot bone - the foot bone to the ankle ... as in nature the sun moon and planets and even the stars are connected. FANTASTIC hub - love the quality of research and data you supplied - I'm gonna treat this one! I have a couple of similar sites pointing out some of the points you do. While I do not know whether Global Warming is a fact or if it is man made, what annoys me most is that there is no scientific debate about it - it's all political! If there was a decent debate, without the doubters being ridiculed then I'd be a lot happier about the whole thing!!! There's a lot here Robert! I'll have to look into your sources and see what I can see. You did a great job though... you even have me doubting! (Just a little).